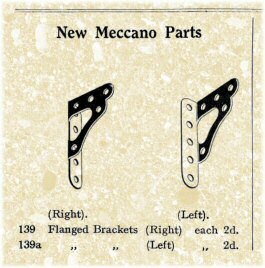 This is a very unusual pair of parts, which have never appeared in any outfits during their lifetime, not even the great pre-war outfits 7 or L. They disappear from the 1983 French parts list but are back again in the 1995 one. 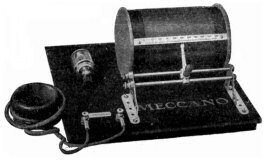 When the original Radio Receiving outfit was found to breach Post Office rules, it was very quickly replaced two months later (in November 1922) with the New Meccano Crystal Radio Receiving Set. The photograph from that issue reproduced below shows that it clearly contains two brackets, which are Corner Gussets (then called "Architraves"), part number 108, that have been bent at right-angles. 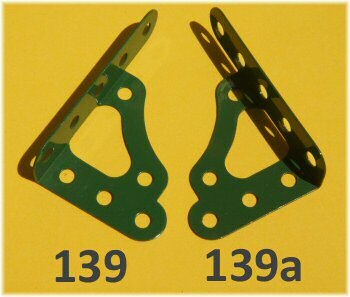 A few months later, in the May 1923 issue, the new parts 139 and 139a were introduced, as shown to the right. It's pretty easy to remember which is which: place the part down with the 'long' part of the flange pointing up, and the shaped part will point left on the left-hand version and right on the right-hand version. As with the Corner Gusset, there are no changes to this part throughout its life other than the change in finish. Well, no, not absolutely no changes. 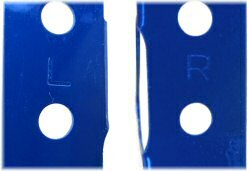 The 1978 dark blue flanged brackets are in fact marked with the letters L and R to identify left and right variants. And they say Meccano has only dumbed down recently! The boxes above show that these parts were supplied post-war in boxes of six at a time. The left-hand box is for part 139, in light green because of the light green label. 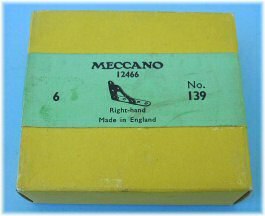 The right-hand box is for part 139a and earlier, signifying that it contains medium green parts. 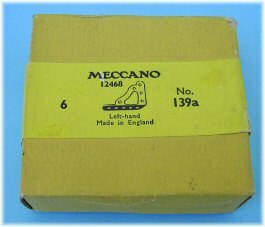 Being a radio ham I was always intested in the Meccano crystal set. I have looked at the original which showed more ingenuity in its design with the "Meccano" variable condensor for tuning. I know the old British GPO had some funny rules but I am intregued to know what the objection was. By the way the old crystal set will disappear into history in a couple of years with the change to digital radio. A sad thing. No more being able to make a radio out of old junk. eg telephone earpiece, galena xtal made from lead and sulphur (or an old Gillette blue razor blade) and wire from old transformers or motors and cardboard for the formers.